Yogo Gulch, Montana, is one of the world's premier sapphire deposits. Although most of the gem rough from this mine is small, the average clarity is very good, and the color is "as good as it gets." Without any need for heat treatment, Yogo sapphires tend to be a gorgeous medium blue (often referred to as cornflower blue). Shown above is a beautiful, untreated, natural blue sapphire from Yogo Gulch. Currently, the Yogo Gulch mines are producing very little material. The gem rough and stones that do reach the market are mostly obtained from local residents of Sapphire Village, MT, whose property ownership affords them digging/mining priviledges to a small section of the sapphire-containing dike. Large-scale mining opeartions have only been sporadic over the last 100 years, and are currently suspended. The high per carat price of Yogo Gulch sapphires reflects the scarcity of natural blue sapphire of fine clarity (no heat treatment of any kind has taken place) and the origin of the gem material. The pear-shaped Yogo Gulch sapphire shown above has excellent clarity and beautiful color. This stone would look great when set in a small pendant, pin, or ring. Inverell is actually located a great distance south of the Anakie gemfields, but the sapphire that is mined there, and the methods used in their production, are very similar to those of Anakie. Australian sapphire comes in a varitey of beautiful colors including blues, yellows, greens, reds, oranges, and pinks. Sometimes, multiple colors occur in a single rough sapphire crystal. 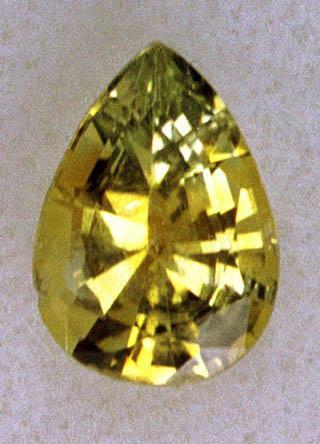 Shown above is what is referred to as a "Parti" colored sapphire; a gemstone that shows areas of both blue and yellow (And green where the colors blend). When the colors are distributed in a pattern that allows the lapidary to obtain an interesting and distinct color separation, extermely unusual and beautiful gemstones are the result. Shown above is a gorgeous little sapphire of good cut and very fine clarity that would be a most unusual centerpiece in a custom designed pendant or pin. 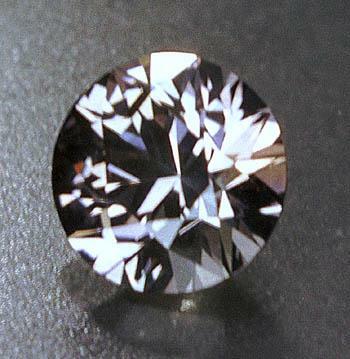 The Subera gemfield is located a short distance from the Anakie gemfields, but the sapphires mined there, and the methods used in their production, are very similar to those of Anakie. Australian sapphire comes in a varitey of beautiful colors including blues, yellows, greens, reds, oranges, and pinks. Much Australian sapphire is dark and very dichroic. Viewed in one direction a sapphire might be dark blue. 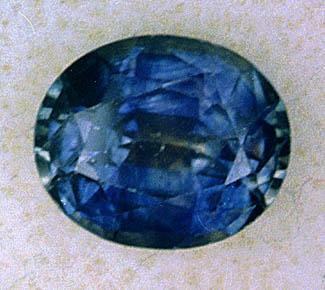 Viewed in a different direction the same sapphire might appear green. 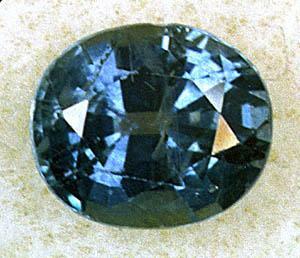 Although quite dark, the above gemstone shows flashes of both dark green and blue. This expertly crafted gemstone would be and attractive and unusual center stone in a pendant, pin, or ring. Australian sapphire comes in a varitey of beautiful colors including blues, yellows, greens, reds, oranges, and pinks. Much Australian sapphire is dark and very dichroic. Viewed in one direction a sapphire might be dark blue. 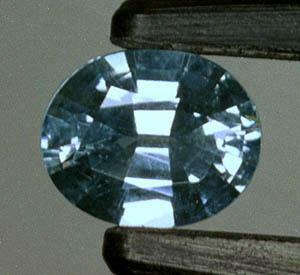 Viewed in a different direction the same sapphire might appear green. The very deep blue sapphire shown above was cut to best display the intense color of the original sapphire crystal. This expertly crafted gemstone would work well in a pendant or pin. Australian sapphire comes in a varitey of beautiful colors including blues, yellows, greens, reds, oranges, and pinks. Much Australian sapphire is dark and very dichroic. Viewed in one direction a sapphire might be dark blue. 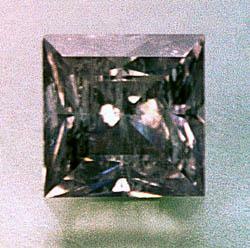 Viewed in a different direction, the sapphire might appear green. 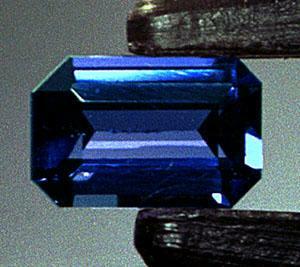 The sapphire shown above shows flashes of both deep blue and blue-green. This expertly faceted gemstone would look nice in either a pendant, pin, or ring. Sapphire from Montana also contains rutile and the color and clarity of Montana sapphires can also be improved by heat treatment. The above stone has been heated. In this case the rutile inclusions were not uniformly distributed throughout the sapphire. When the rutile dissolved, it caused the formation of blue color bands in the cooled crystal. This explains the mottled blue-green color of this gemstone. It should be noted that color zoning is also common in completely natural sapphire; just the way nature made it. This Thai-cut gemstone is reasonably well crafted. The proprotion, meetpoints, and polish are all relatively good. This gem would work well in a ring, pendant or pin. Sapphire from Montana also contains rutile and the color and clarity of Montana sapphires can also be improved by heat treatment. The above stone has been heated. In this case the rutile inclusions were not uniformly distributed throughout the sapphire. When the rutile dissolved, it caused the formation of blue color bands in the cooled crystal. This explains the slightly mottled blue-green color of this gemstone. It should be noted that color zoning is also common in completely natural sapphire; just the way nature made it. This Thai-cut gemstone is reasonably well crafted. The proprotion, meetpoints, and polish are all relatively good. This gem would work well in a ring, pendant or pin. 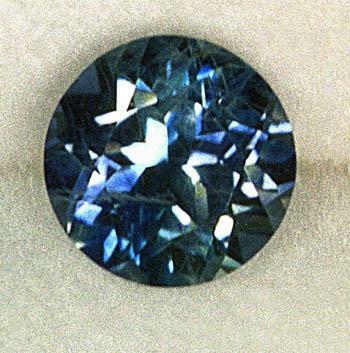 Shown above is an attractive Montana sapphire that is a medium dark, greenish-blue color. Many natural sapphire crystals contain tiny included crystals of the mineral rutile. The tiny inclusions cause the crystal to look cloudy. 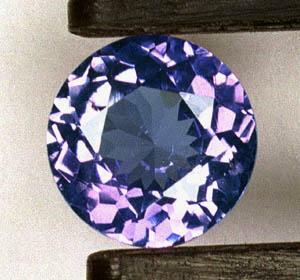 Long ago the sapphire miners in Ceylon and Asia learned that if they heated cloudy sapphire, both the clairty and color of the treated gemstones could be improved. Sapphire from Montana also contains rutile and the color and clarity of Montana sapphires can also be improved by heat treatment. The above stone has been heated. 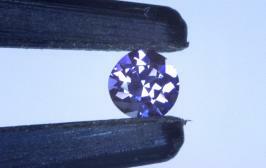 This sapphire was cut by an automated machine. The proprotions, meetpoints, and polish are good. The gem would look beautiful in a pendant, pin, or ring. Shown above is a nice little sapphire of light lavender color. The stone is well cut and displays a nice pattern of scintillation. It would look great in a small pendant, pin, or ring. Sapphire is commonly heat treated to improve both color and clarity. 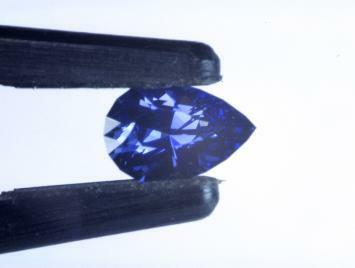 The above sapphires should be assumed to have been heat treated. 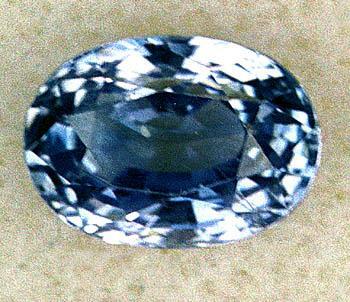 Shown above is a Montana sapphire of medium blue color. El Dorado Bar, on the shores of the Missouri River, near Helena, was first mined for gold. The abundance of light blue and green sapphire crystals, found with the gold, proved to be a great bonus. El Dorado Bar is no longer producing large quantities of gem sapphire, but stones can occasionally be obtained from old mine supplies. The above gem, a native cut stone of good size, would like great in a pendant, pin or ring. Sapphire is commonly heated to improve both clarity and color. The above stone has been so treated. Shown above is a Montana sapphire of medium, slightly greenish-blue color. El Dorado Bar, on the shores of the Missouri River, near Helena, was first mined for gold. The abundance of light blue and green sapphire crystals, found with the gold, proved to be a great bonus. El Dorado Bar is no longer producing large quantities of gem sapphire, but stones can occasionally be obtained from old mine supplies. The above gem, a native cut stone of good size and clarity, would like great in a pendant, pin or ring. Shown here is a light lavender sapphire with a slight yellow tint to it (The yellow is barely evident in the image). The rough gem crystal was predominantly lavender in color, but there was a tiny yellow area that was retained after faceting. At one viewing angle the stone appears lavender in color. At a different viewing angle the stone appears almost yellow. This stone is another example of the unusual color combinations that come from the Gem Mountain, Montana, gemfields. This heat-treated stone would make a beautiful ring or pendant. Yogo Gulch, Montana, is one of the world's premier sapphire deposits. Although most of the gem rough from this mine is small, the average clarity is very good, and the color is "as good as it gets." Without any need for heat treatment, Yogo sapphires tend to be a gorgeous medium blue (often referred to as cornflower blue). Shown above is a beautiful, untreated, natural blue sapphire from Yogo Gulch. Currently, the Yogo Gulch mines are producing very little material. The gem rough and stones that do reach the market are mostly obtained from local residents of Sapphire Village, MT, whose property ownership affords them digging/mining priviledges to a small section of the sapphire-containing dike. Large-scale mining opeartions have only been sporadic over the last 100 years, and are currently suspended. The high per carat price of Yogo Gulch sapphires reflects the scarcity of natural blue sapphire of fine clarity (no heat treatment of any kind has taken place) and the origin of the gem material. The emerald cut Yogo Gulch sapphire shown above has excellent clarity and beautiful color. When this stone was cut, the facetor left a small section of original crystal surface along what would be the knife-edge of the pavilion. This detail is not eye-visible, but is simply noted as a point of interest (The rough sapphire crystals from Yogo Gulch tend to be thin and tabular in shape. Facetors do everything possible to obtain the largest and most attractive gemstone. After all, Mother Nature didn't make a lot of sapphire of this color and clarity!) This stone would look great when set in a small pendant, pin, or ring. Shown above is a fancy colored sapphire reported to have come from an African source. 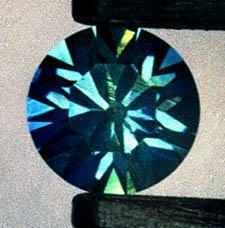 The sapphire crystal from which this gem was cut was color zoned. There is a darker yellowish-orange band passing through the center of the stone, and a very light greenish zone toward the tip of the gem. The combined effect of the color zoning is a very intriguing appearance. This is a native cut gemstone; the facet shapes and proportions are somwhat "off," but the polish is good. Overall, the stone is very attractive. It would look great as the centerpiece in a pendant, pin, or ring. Note: Sapphire is commonly heat treated to improve both clarity and color. It should be assumed that the above gemstone has been so treated. Shown above is a natural fancy-colored sapphire from an unknow African location. Although this is a native cut stone, the faceting is reasonably good; the proprotion and facet shape are acceptable, and the polish is very good. 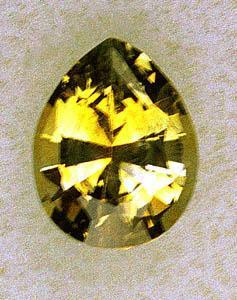 The color is unusual because the crystal from which this stone was cut had both yellow and blue areas. The gem is primarily a golden yellow, but there are blue zones around the edges that are more or less noticeable as the stone is moved. The result is quite intriguing. 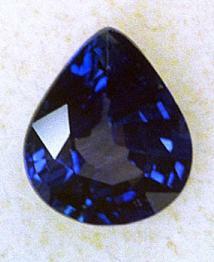 Shown above is a natural medium-blue sapphire from Ceylon. Although this is a native cut stone, the faceting is reasonably good; the proprotion and facet shape are acceptable, and the polish is very good. This gorgeous little stone would look great in a pendant, pin, or ring. 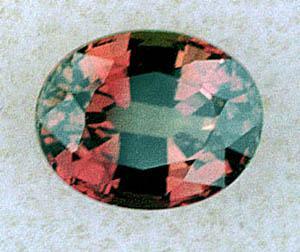 Shown above is a fancy reddish-brown sapphire from Africa. Although this is a native cut gemstone, the overall facet shapes, meets, polish, and light return are all reasonably good. There is a window in this stone, but there is still good scintillation over much of the crown. 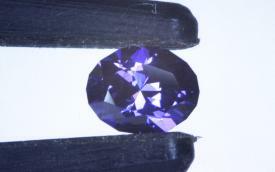 This sapphire is very reasonably priced and would look most unusual in a pendant, pin, or ring. 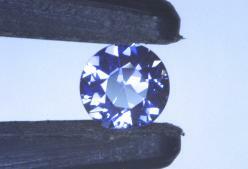 Note: Much natural sapphire is heat treated to improve both clarity and color. It should be assumed that the above sapphire has been thus treated. 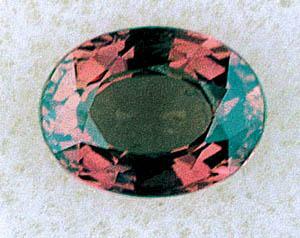 Shown above is a fancy reddish-brown sapphire from Africa. Although this is a native cut gemstone, the overall facet shapes, meets, polish, and light return are all reasonably good. There is a small window in this stone, but there is still good scintillation over most of the crown. 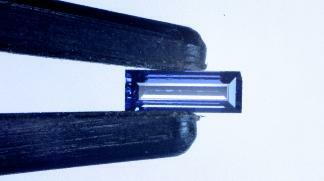 This sapphire is very reasonably priced and would look most unusual in a pendant, pin, or ring. Shown above is a dark purple sapphire from Tanzania, Africa. . The cutting is exceptionally fine. In sunlight this gem is ablaze with tiny purple and reddish-purple flashes of color. In indirect light the color is lost and the stone is a dark grayish-purple. 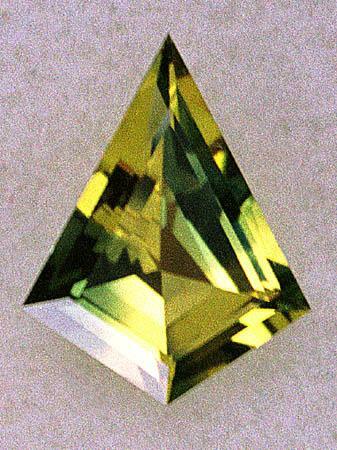 Songea sapphire shows color variation dependant upon the angle at which the crystal is viewed. Viewed from various directions, the crystal from which this gem was cut appeared purple, reddish-purple or gray. 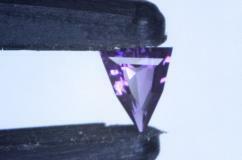 Cut properly, the preferred purple color shows in the finished gemstone. 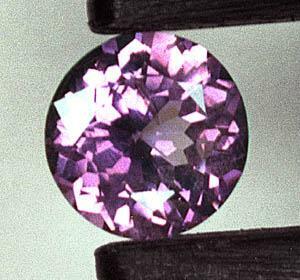 The result of this pleochroism is an unusual fancy colored sapphire that has flashes of both purple and reddish-purple. Although most sapphire has been heated to improve both color and clarity, the small inclusions in this gem indicate that it has not be treated. 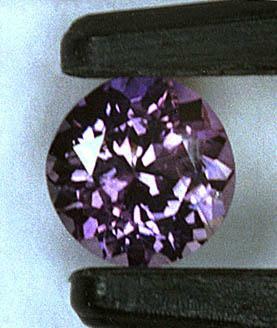 Shown above is a medium, purplish-colored sapphire from Ceylon. Although this is a native cut stone, the faceting is quite good. The proprotions, facet shape, meetpoints and polish, as well as the clarity, are all good. This beautiful gemstone would look great in a pendant, pin, or ring. 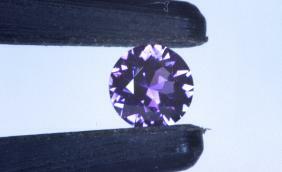 Shown above is a medium depth, lavender-colored sapphire from Ceylon. Although this is a native cut stone, the faceting is quite good. The proprotions, facet shape, meetpoints and polish, as well as the clarity, are all good. This beautiful gemstone would look great in a pendant, pin, or ring. 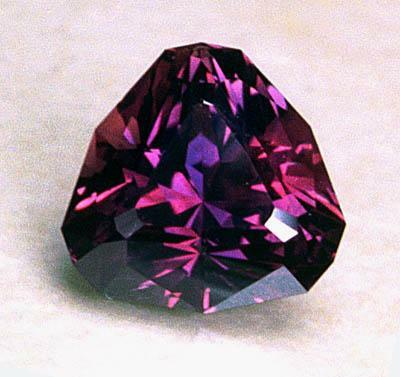 Shown above is a medium dark, purplish-colored sapphire from Ceylon. Although this is a native cut stone, the faceting is quite good. The proprotions, facet shape, meetpoints and polish, as well as the clarity, are all good. This beautiful gemstone would look great in a pendant, pin, or ring. Yogo Gulch, Montana, is one of the world's premier sapphire deposits. Although most of the gem rough from this mine is small, the average clarity is very good, and the color is "as good as it gets." Without any need for heat treatment, Yogo sapphires tend to be a gorgeous medium blue (often referred to as cornflower blue). Shown above is a beautiful, untreated, natural blue sapphire from Yogo Gulch. Currently, the Yogo Gulch mines are producing very little material. The gem rough and stones that do reach the market are mostly obtained from local residents of Sapphire Village, MT, whose property ownership affords them digging/mining priviledges to a small section of the sapphire-containing dike. Large-scale mining opeartions have only been sporadic over the last 100 years, and are currently suspended. The high per carat price of Yogo Gulch sapphires reflects the scarcity of natural blue sapphire of fine clarity (no heat treatment of any kind has taken place) and the origin of the gem material. The tiny rectangular-shaped Yogo Gulch sapphire shown above has excellent clarity and beautiful color. This stone would serve well as an accent in a small pendant, pin, or ring. Yogo Gulch, Montana, is one of the world's premier sapphire deposits. Although most of the gem rough from this mine is small, the average clarity is very good, and the color is "as good as it gets." Without any need for heat treatment, Yogo sapphires tend to be a gorgeous medium blue (often referred to as cornflower blue). 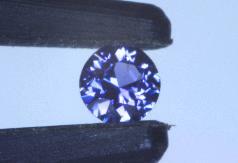 Shown above is a beautiful, untreated, natural blue sapphire from Yogo Gulch. Currently, the Yogo Gulch mines are producing very little material. The gem rough and stones that do reach the market are mostly obtained from local residents of Sapphire Village, MT, whose property ownership affords them digging/mining priviledges to a small section of the sapphire-containing dike. Large-scale mining opeartions have only been sporadic over the last 100 years, and are currently suspended. The high per carat price of Yogo Gulch sapphires reflects the scarcity of natural blue sapphire of fine clarity (no heat treatment of any kind has taken place) and the origin of the gem material. The small round Yogo Gulch sapphire shown above has excellent clarity and beautiful color. This stone would serve well as an accent in a small pendant, pin, or ring. Yogo Gulch, Montana, is one of the world's premier sapphire deposits. Although most of the gem rough from this mine is small, the average clarity is very good, and the color is "as good as it gets." Without any need for heat treatment, Yogo sapphires tend to be a gorgeous medium blue (often referred to as cornflower blue). Shown above is a beautiful, untreated, natural blue sapphire from Yogo Gulch. Currently, the Yogo Gulch mines are producing very little material. The gem rough and stones that do reach the market are mostly obtained from local residents of Sapphire Village, MT, whose property ownership affords them digging/mining priviledges to a small section of the sapphire-containing dike. Large-scale mining opeartions have only been sporadic over the last 100 years, and are currently suspended. The high per carat price of Yogo Gulch sapphires reflects the scarcity of natural blue sapphire of fine clarity (no heat treatment of any kind has taken place) and the origin of the gem material. The small oval-shaped Yogo Gulch sapphire shown above has excellent clarity and beautiful color. This stone would serve well as the centerpiece of a small pendant, pin, or ring. Yogo Gulch, Montana, is one of the world's premier sapphire deposits. Although most of the gem rough from this mine is small, the average clarity is very good, and the color is "as good as it gets." Without any need for heat treatment, Yogo sapphires tend to be a gorgeous medium blue (often referred to as cornflower blue). Shown above is a beautiful, untreated, natural blue sapphire from Yogo Gulch. Currently, the Yogo Gulch mines are producing very little material. The gem rough and stones that do reach the market are mostly obtained from local residents of Sapphire Village, MT, whose property ownership affords them digging/mining priviledges to a small section of the sapphire-containing dike. Large-scale mining opeartions have only been sporadic over the last 100 years, and are currently suspended. The high per carat price of Yogo Gulch sapphires reflects the scarcity of natural blue sapphire of fine clarity (no heat treatment of any kind has taken place) and the origin of the gem material. The small oval-shaped Yogo Gulch sapphire shown above has excellent clarity and a beautiful purplish-blue color. This stone would serve well as the centerpiece of a small pendant, pin, or ring. Yogo Gulch, Montana, is one of the world's premier sapphire deposits. Although most of the gem rough from this mine is small, the average clarity is very good, and the color is "as good as it gets." Without any need for heat treatment, Yogo sapphires tend to be a gorgeous medium blue (often referred to as cornflower blue). Shown above is a beautiful, untreated, natural blue sapphire from Yogo Gulch. Currently, the Yogo Gulch mines are producing very little material. The gem rough and stones that do reach the market are mostly obtained from local residents of Sapphire Village, MT, whose property ownership affords them digging/mining priviledges to a small section of the sapphire-containing dike. Large-scale mining opeartions have only been sporadic over the last 100 years, and are currently suspended. The high per carat price of Yogo Gulch sapphires reflects the scarcity of natural blue sapphire of fine clarity (no heat treatment of any kind has taken place) and the origin of the gem material. The tiny round Yogo Gulch sapphire shown above has excellent clarity and a beautiful blue color. This stone would serve well as an accent stone in a small pendant, pin, or ring. Yogo Gulch, Montana, is one of the world's premier sapphire deposits. Although most of the gem rough from this mine is small, the average clarity is very good, and the color is "as good as it gets." Without any need for heat treatment, Yogo sapphires tend to be a gorgeous medium blue (often referred to as cornflower blue). Shown above is a beautiful, untreated, natural blue sapphire from Yogo Gulch. Currently, the Yogo Gulch mines are producing very little material. The gem rough and stones that do reach the market are mostly obtained from local residents of Sapphire Village, MT, whose property ownership affords them digging/mining priviledges to a small section of the sapphire-containing dike. Large-scale mining opeartions have only been sporadic over the last 100 years, and are currently suspended. The high per carat price of Yogo Gulch sapphires reflects the scarcity of natural blue sapphire of fine clarity (no heat treatment of any kind has taken place) and the origin of the gem material. The tiny freeform cut Yogo Gulch sapphire shown above has excellent clarity and a beautiful bluish-purple color. This stone would serve well as an accent stone in a small pendant, pin, or ring. Yogo Gulch, Montana, is one of the world's premier sapphire deposits. Although most of the gem rough from this mine is small, the average clarity is very good, and the color is "as good as it gets." Without any need for heat treatment, Yogo sapphires tend to be a gorgeous medium blue (often referred to as cornflower blue). Shown above is a beautiful, untreated, natural blue sapphire from Yogo Gulch. Currently, the Yogo Gulch mines are producing very little material. The gem rough and stones that do reach the market are mostly obtained from local residents of Sapphire Village, MT, whose property ownership affords them digging/mining priviledges to a small section of the sapphire-containing dike. Large-scale mining opeartions have only been sporadic over the last 100 years, and are currently suspended. The high per carat price of Yogo Gulch sapphires reflects the scarcity of natural blue sapphire of fine clarity (no heat treatment of any kind has taken place) and the origin of the gem material. The little brilliant cut Yogo Gulch sapphire shown above has excellent clarity and a beautiful blue color. This stone would serve well as an accent stone in a small pendant, pin, or ring. 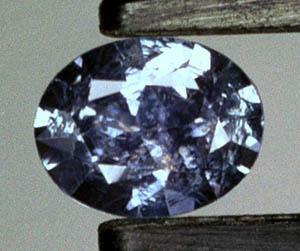 Shown above is a natural blue sapphire reported to have come from Madagascar. Although this is a native cut stone, the faceting is reasonably good; the proprotion and facet shape are acceptable, and the polish is very good. The color is a very fine deep blue. This beutiful little stone would look great in a pendant, pin, or ring. Note: Sapphire is commonly heat treated to improve both clarity and color. It should be assumed that the above gemstone has been so treated.. 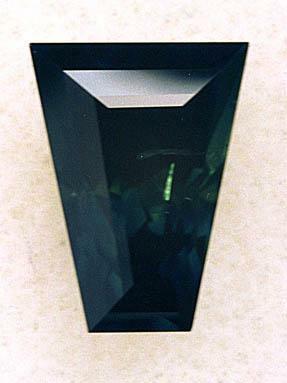 Shown above is a medium dark, slightly greenish-blue sapphire cut from gem rough mined in Songea, Tanzania. The faceting is excellent. The cutting pattern is by Robert Long. The sapphire crystals from this locale display remarkable dichroism. 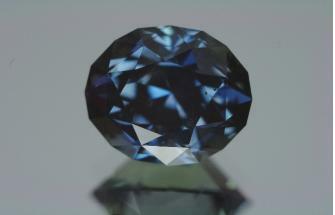 The gem rough was a deep blue when viewed in one direction, and a greenish-blue when viewed in a different orientation. 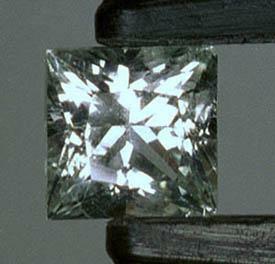 The stone was cut to display the best color when viewed face up (See video). This unusual stone would look great in a ring, pendant, or pin.